Featured below is a chronology of various attempts through the last four centuries to visually organise and make sense of colour. 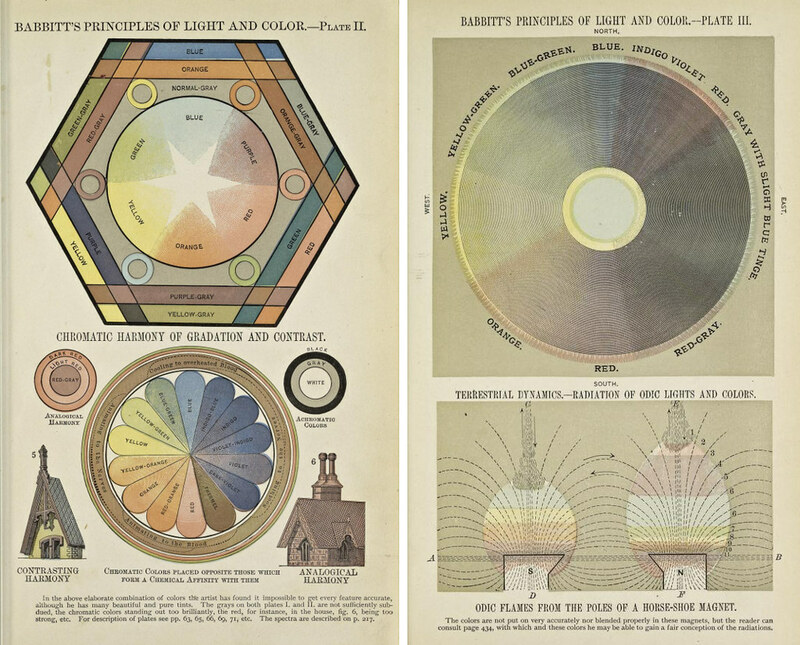 A wide variety of forms and methods are represented: from simple wheels to multi-layered pyramids, from scientific systems to those based on the hues of human emotion. Many of the images are directly, or indirectly, sourced from Sarah Lowengard’s excellent The Creation of Color in Eighteenth-Century Europe – published electronically on Gutenberg-e in 2006 – a highly recommended read if you’re keen to find out more about the fascinating history of colour, and also background on many of the images below. 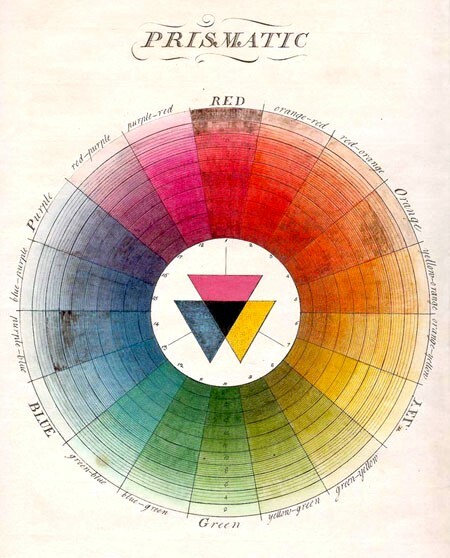 Also check out Philip Ball’s Bright Earth: Art and the Invention of Color (2003) for a great look at how art, chemistry, and technology have interacted through the ages. Various sources, see link with individual image for details. 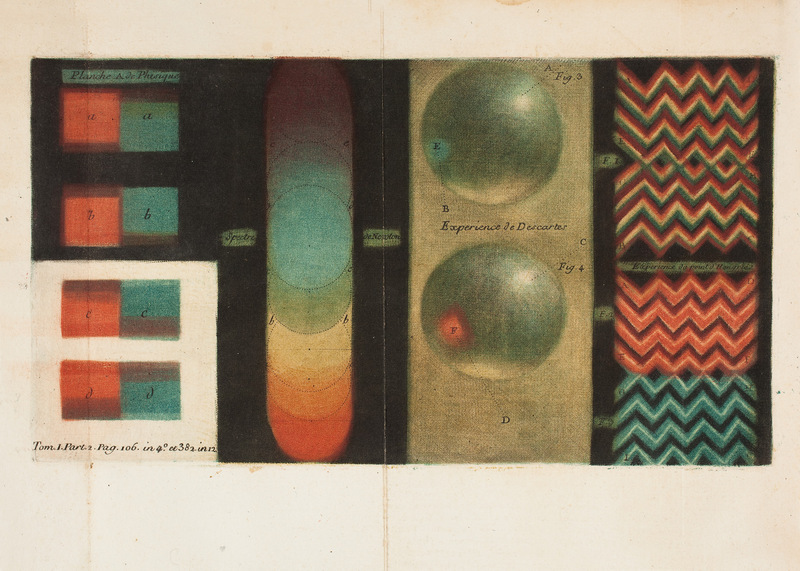 Richard Waller’s “Tabula Colorum Physiologica”, from “A Catalogue of Simple and Mixt Colours with a Specimen of Each Colour Prefixt Its Properties,” in Philosophical Transactions of the Royal Society of London, vol. 6 for the years 1686 and 1687 (1688) – Source. Illustrations from the 1708 edition of Traité de la peinture en mignature, an artist’s manual attributed to “C.B.” (most likley to be Claude Boutet) – Source. 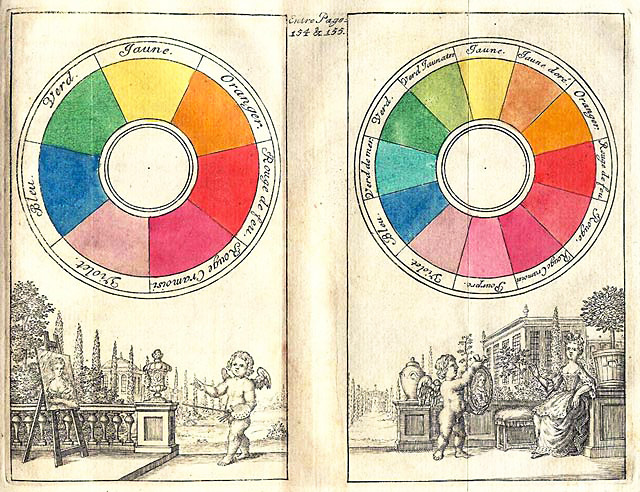 A chart from 1746 by Jacques-Fabien Gautier illustrating his theory that the primary colours are black and white, with red, yellow, and blue being secondary. 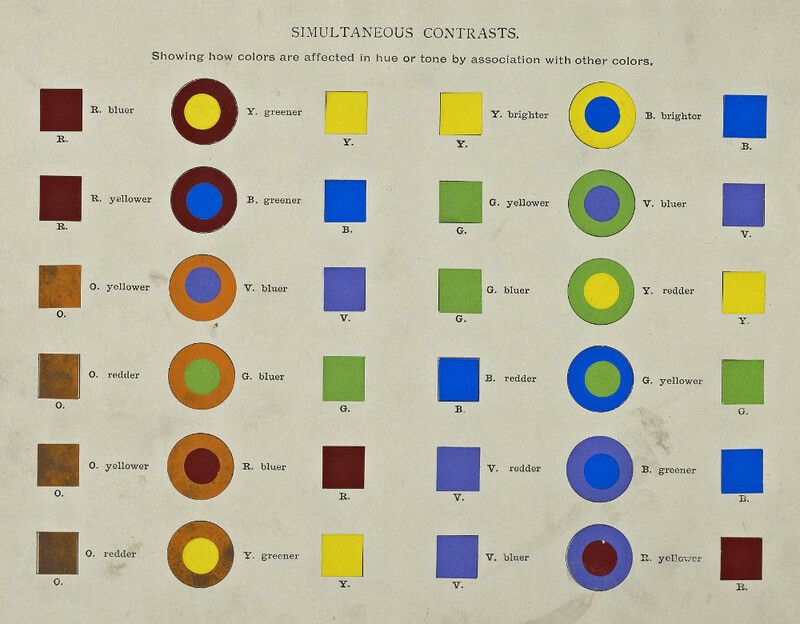 Colours were thought to be drawn out of the shadows by the presence of light – Source. 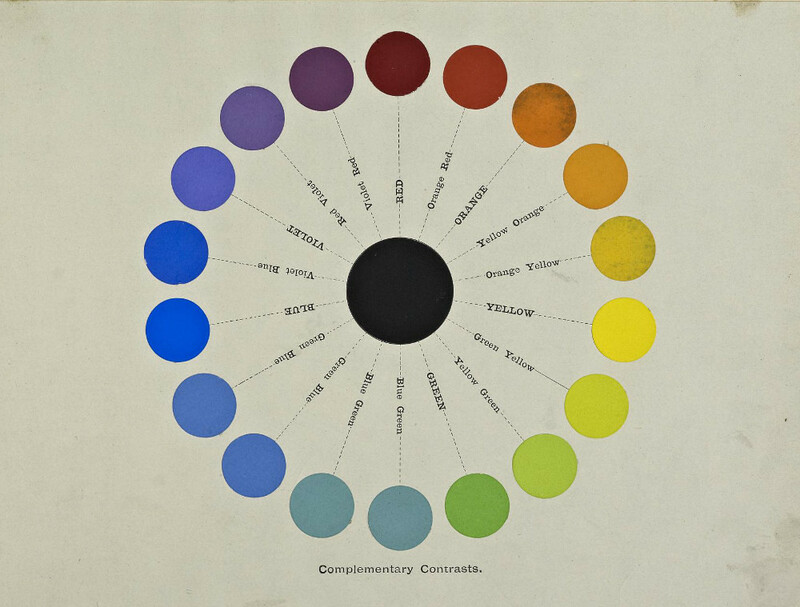 A shaded colour wheel from the pen of British entomologist Moses Harris, featured in his The Natural System of Colours (1766) – Source. 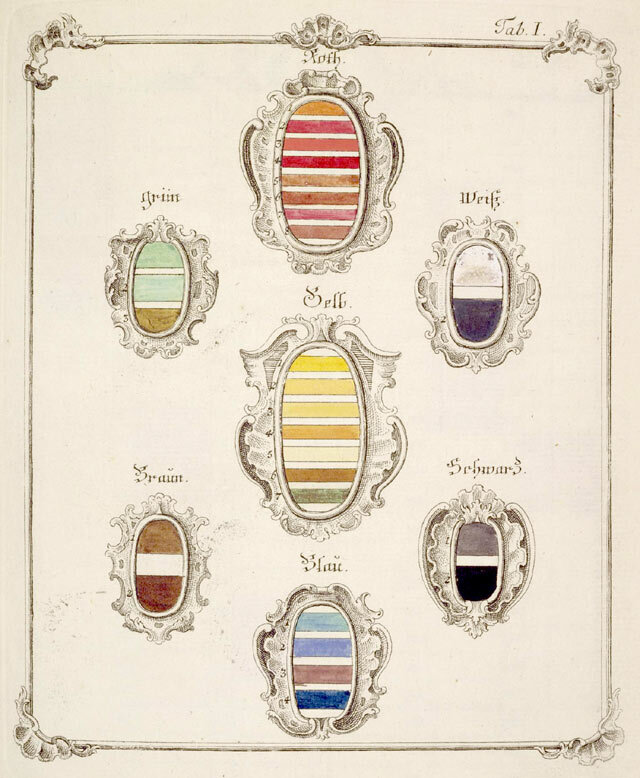 Image from Jacob Christian Schäffer’s Entwurf einer allgemeinen Farbenverein (1769) illustrating the idea of colour as genealogical and hierarchical: the principal colors are not presented as a continuous line but as families, each with its own coat of arms – Source. 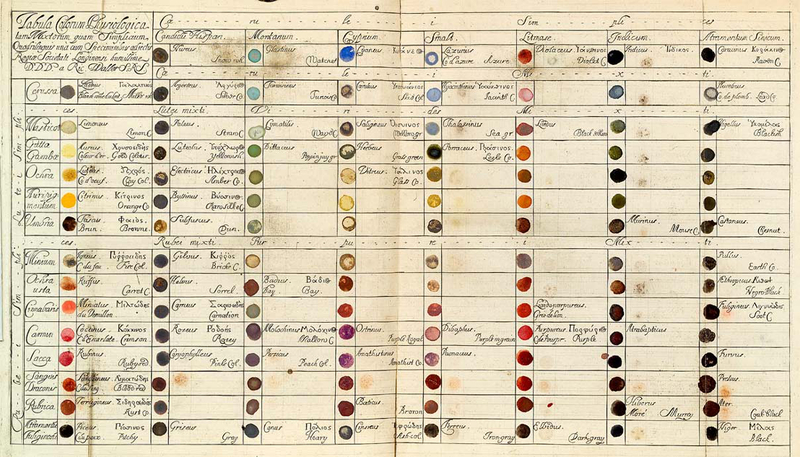 Colour wheel by the Austrian entomologist Ignaz Schiffermüller, featured in his treatise on colour Versuch eines Farbensystems (1772) – Source. 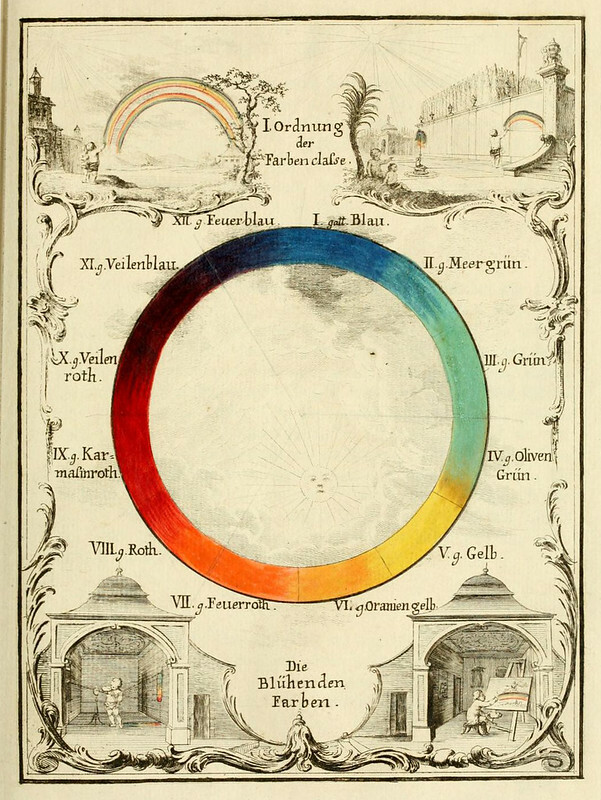 Georg Christoph Lichtenberg’s representation of the three-sided color graph developed by the astronomer and mapmaker Tobias Mayer – Source. 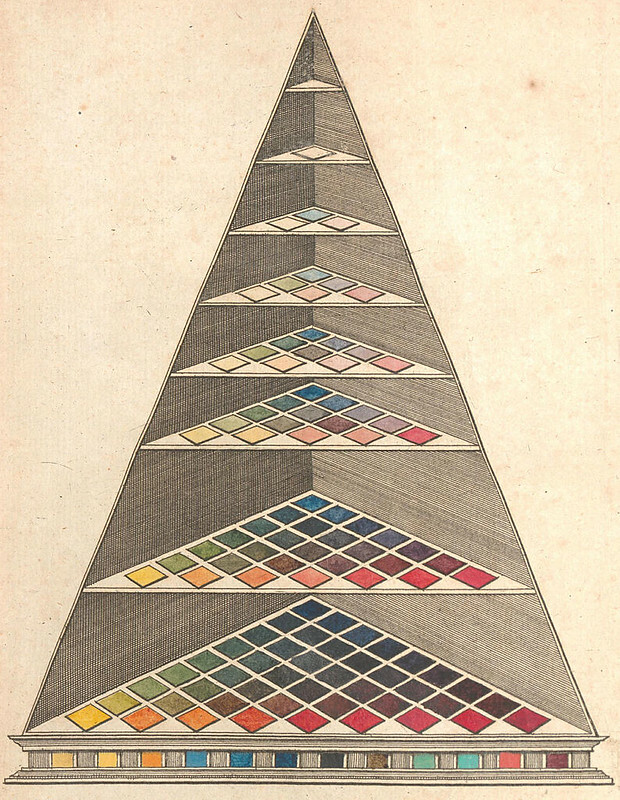 Johann Heinrich Lambert’s three-dimensional adaptation of Tobias Mayer’s triangle, featured in his Beschreibung einer mit dem Calauschen Wachse ausgemalten Farbenpyramide (1772) – Source. 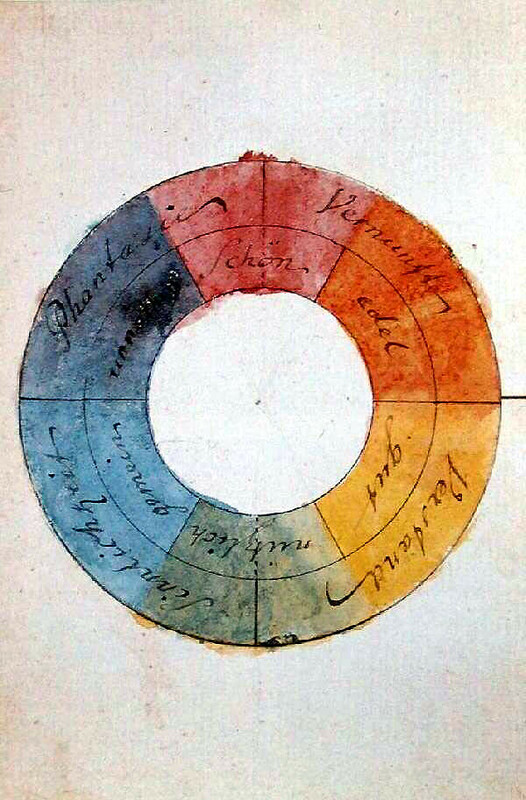 The “rose of temperaments” (Temperamentenrose), a study from 1798/9 by Goethe and Schiller, matching twelve colours to human occupations and character traits (tyrants, heroes, adventurers, hedonists, lovers, poets, public speakers, historians, teachers, philosophers, pedants, rulers), grouped in the four temperaments – Source. 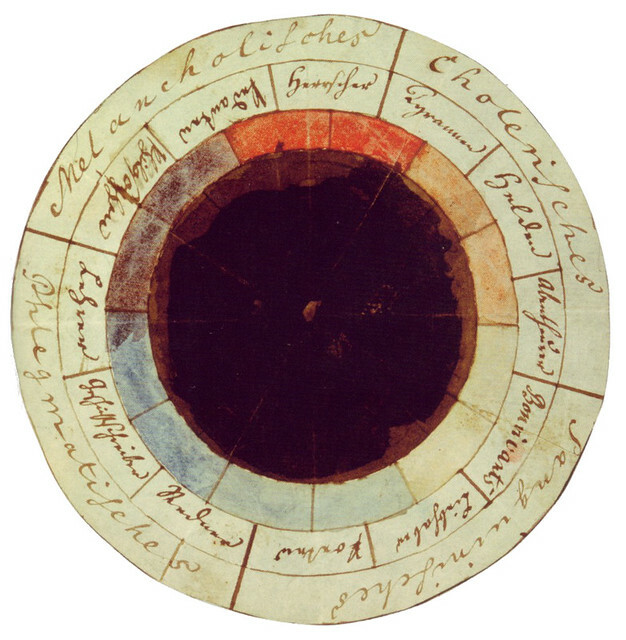 Goethe’s famous colour wheel, created in 1809, was used to illustrate the chapter “Allegorical, symbolic, and mystical use of colour” in his seminal work Farbenlehre (1810) – Source. 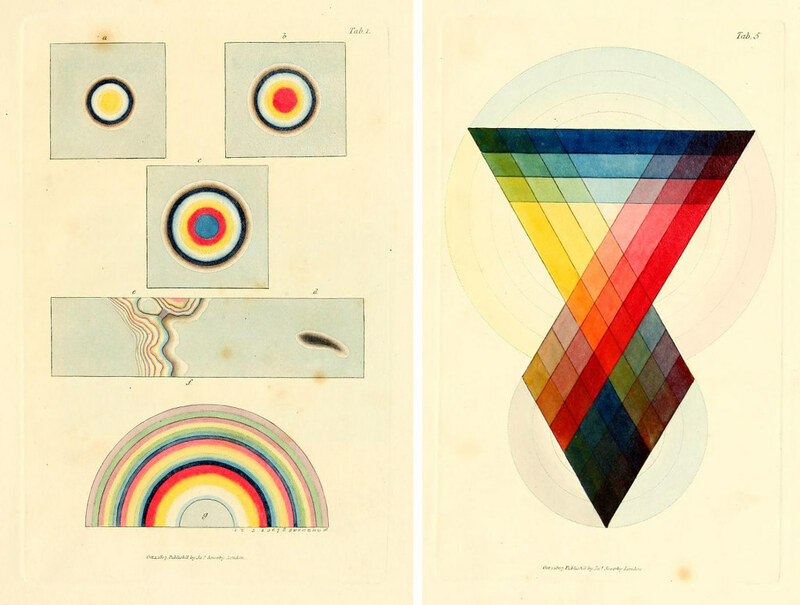 Two plates from James Sowerby’s A New Elucidation of Colours, Original, Prismatic, and Material (1809) – Source. 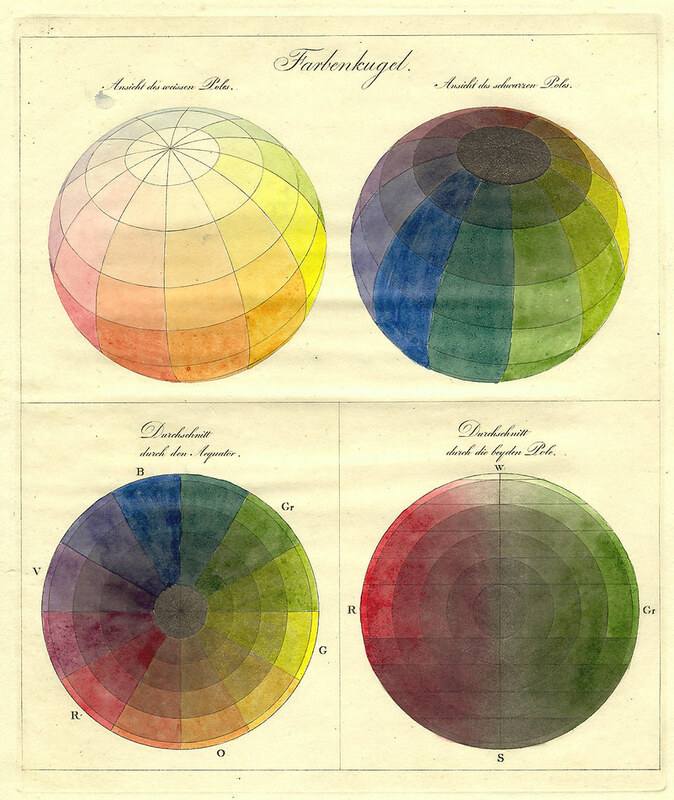 Philipp Otto Runge’s Farbenkugel (1810). The top two images show the surface of the sphere, while the bottom two show horizontal and vertical cross sections – Source. 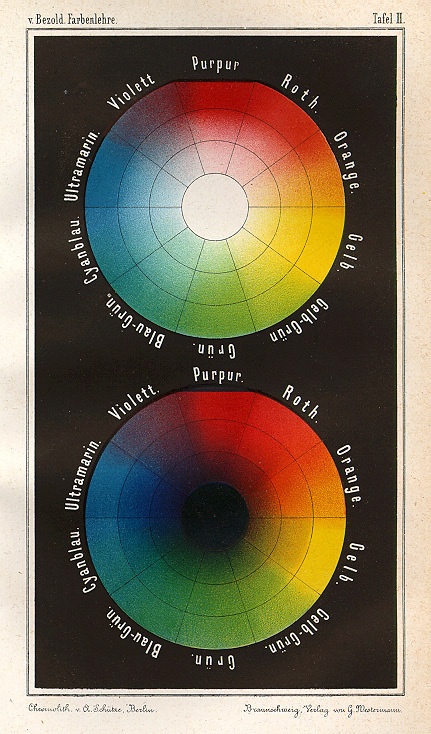 Wilhelm von Bezold’s Farbentafel (1874) – Source. Two plates from, the wonderfully titled, The Principles of Light and Color: including among other things the harmonic laws of the universe, the etherio-atomic philosophy of force, chromo chemistry, chromo therapeutics, and the general philosophy of the fine forces, together with numerous discoveries and practical applications (1878) – Source. 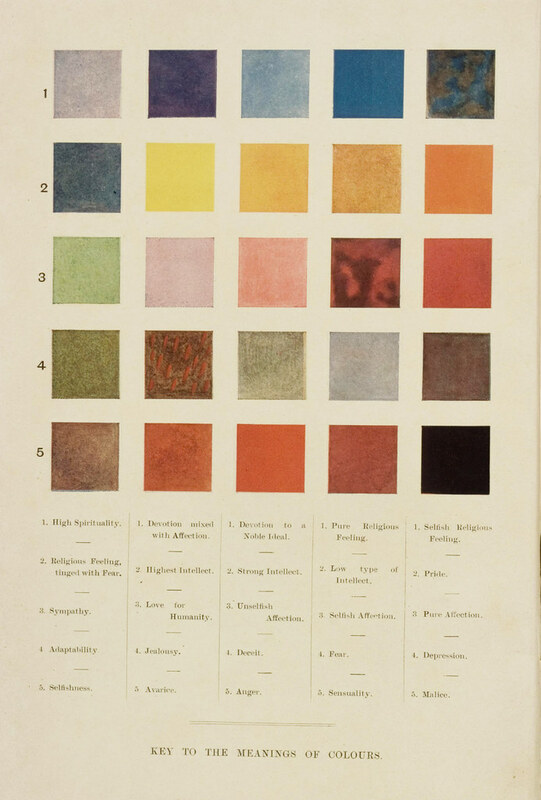 A chart showing “simultaneous contrasts” from A Class-Book of Color: including color definitions, color scaling, and the harmony of colors (1895) by Mark Maycock – Source. 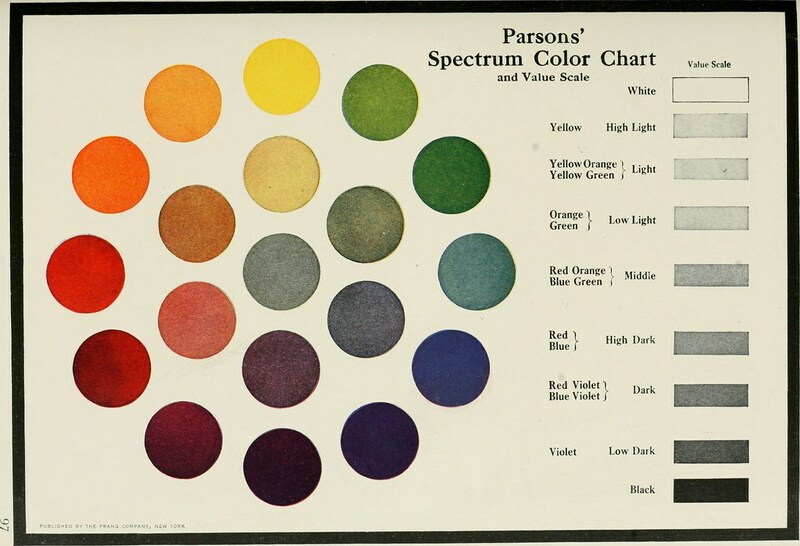 Circular chart showing “complementary contrasts” from A Class-Book of Color: including color definitions, color scaling, and the harmony of colors (1895) by Mark Maycock – Source. 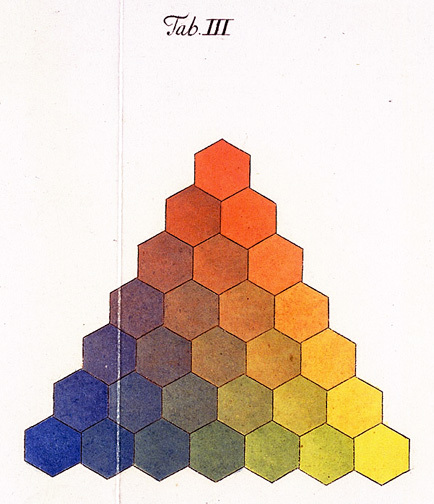 Frontispiece to Annie Besant and Charles Leadbetter’s Thought-Forms (1905), ascribing colours to particular emotions – Source. Frank Alvah Parsons – Source. 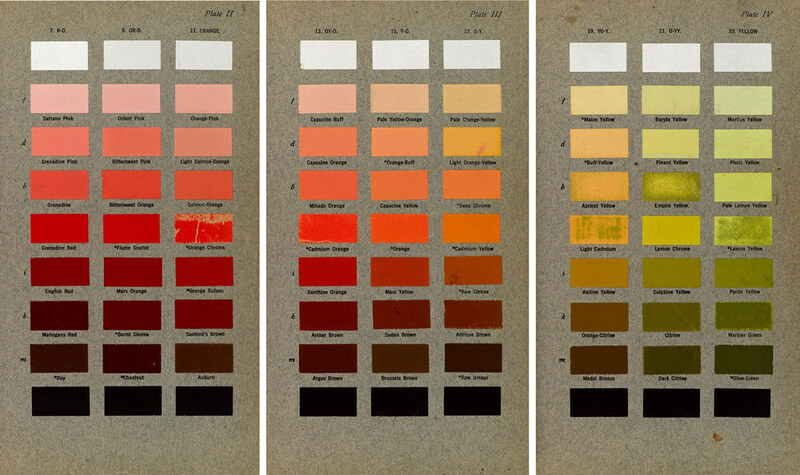 Three plates from Robert Ridgeway’s Color Standards and Color Nomenclature (1912) – Source. 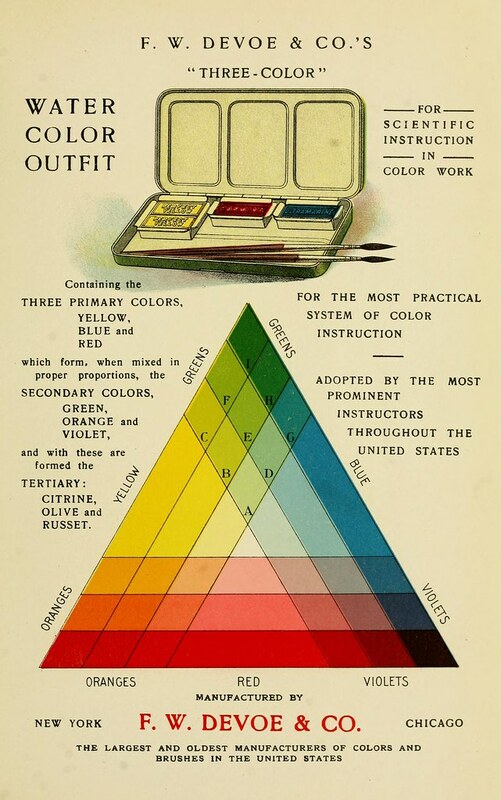 Page from Priced catalogue of artists’ materials : supplies for oil painting, water color painting, china painting … and drawing materials for architects and engineers, manual training schools and colleges (1914) – Source.